Arrhythmogenic right ventricular cardiomyopathy (ARVC) is a primary disease of heart muscle that results in fibrofatty replacement of the right ventricle and the subepicardial region of the left ventricle. Patients are at high risk for ventricular tachyarrhythmias and sudden death (see the image below). Arrhythmogenic right ventricular cardiomyopathy (ARVC), biventricular, autopsy heart in a young man who died suddenly playing basketball. Top left demonstrates increased fat in the outer walls of the right ventricle and left ventricular posterolateral walls. A higher magnification of the right ventricle is seen at the top right image; the anterior wall is nearly completely replaced with fat, and fibrofatty irregular posterior wall involvement is seen. Note that no actual thinning of the wall itself exists, although the muscular portion is in some areas completely missing. The bottom left image demonstrates a full thickness of the right ventricle stained with Masson trichrome. The residual muscle is present only in a bandlike area of scarring, and subepicardial scarring is present as well. The characteristic myocyte vacuolization, depicted in the bottom right image, is seen in nearly all areas of ARVC within the scarred areas. Although ARVC was initially described in the right ventricle,  examination of the heart in autopsy cases of ARVC, microscopically or with sensitive imaging techniques,  has established that most patients with ARVC have biventricular involvement. The left ventricular involvement is typically subepicardial, and the changes are related more to fibrosis than to fat or fibrofatty infiltration, although at times the changes are probably similar to those seen in the right ventricle. However, because the right ventricle is relatively thin, the subepicardial nature of disease is difficult to appreciate in imaging studies and has only infrequently been investigated at autopsy. Atrial involvement appears not to have been adequately investigated. Some patients with ARVC develop heart failure and intractable arrhythmias and are treated with heart transplantation. A subset of these patients carries the clinical diagnosis of idiopathic dilated cardiomyopathy. In such patients, the pathologic diagnosis of ARVC is made initially on finding fibrofatty replacement on histologic sections of the recipient's explanted heart. The etiology of arrhythmogenic right ventricular cardiomyopathy (ARVC) is unknown. The presence of inflammatory infiltrates in most cases that have been seen at autopsy has led to the theory that it is a resolving myocarditis. Families have been described with phenotypic alterations ranging from myocarditis to fibrofatty cardiac infiltrates, and imaging studies have demonstrated a progression from myocarditis to ARVC. Family studies have suggested that ARVC is caused by genetic alterations in desmosomal proteins, especially plakoglobin and desmoplakin. [5, 6, 7, 8, 9] One family study demonstrated desmosomal mutations in just less than 20% of patients. Because desmosomal mutations are seen in other cardiac conditions, the link between the desmosome and ARVC has been questioned. ARVC is possibly an inflammatory process modulated by genetic influences in desmosome-related proteins. The prevalence of arrhythmogenic right ventricular cardiomyopathy (ARVC) has been estimated at 1:2500 to 1:5000. In series of sudden cardiac death, this condition represents the cause of 2-5% of deaths in young adults, with higher incidences in exertional deaths  and in certain regions of Europe. (Approximately three quarters of sudden deaths related to ARVC are exertional.) ARVC is a relatively new entity, and its incidence worldwide is not yet established. ARVC is generally limited to the young, especially males younger than 40 years, although the disease has been described up to the ninth decade. This condition is extremely uncommon under the age of 10 years. Because autopsy studies are skewed toward fatal arrhythmogenic right ventricular cardiomyopathy (ARVC) and by consent for autopsy, it has been assumed that ARVC is uniformly lethal. The clinical diagnosis has been hampered by the nonspecificity of electrocardiographic and imaging findings. However, with improvements in cardiac MRI and computed tomography (CT) scanning, the clinical diagnosis has become more precise. The primary symptoms of arrhythmogenic right ventricular cardiomyopathy (ARVC) are related to arrhythmias and conduction disturbances. However, the condition is frequently symptomless, with the first manifestation being sudden, unexpected death. Moreover, symptoms, hemodynamics, and electrocardiographic findings are relatively nonspecific, although advances in cardiac imaging, especially magnetic resonance imaging (MRI), have increased the reproducibility of clinical diagnosis. The diagnosis of ARVC is generally made pathologically at autopsy or at examination of explanted hearts at orthotopic heart transplantation. Endomyocardial biopsy is unreliable, as sampling the apical septum does not typically reveal diagnostic material, and biopsies of the septal endomyocardium may not show the characteristic lesions. At autopsy, the major differential diagnosis includes normal fat deposits in the right ventricle, and subepicardial scars of ischemic origin. Adipose tissue is normally present in the right ventricle, especially in the anterior wall toward the apex, but no associated fibrosis or myocyte changes exist. In the left ventricle, subepicardial scars can be associated with ischemic heart disease, especially if there is embolization of thromboembolic material from epicardial coronary lesions. In cases of unexplained exertional death in young adults, submitting multiple sections of ventricular septum and right ventricle to exclude arrhythmogenic forms of cardiomyopathy is reasonable, as ARVC most typically involves the right ventricle and may be difficult to see grossly; additionally, hypertrophic cardiomyopathy may involve the interventricular septum without obvious grossly abnormalities. Because both of these entities often cause exertional death, taking multiple sections of right ventricle and ventricular septum in cases of exertional deaths is prudent. At autopsy, the major differential diagnosis of arrhythmogenic right ventricular cardiomyopathy (ARVC) includes normal fat deposits in the right ventricle, and subepicardial scars of ischemic origin. Adipose tissue is normally present in the right ventricle, especially in the anterior wall toward the apex, but no associated fibrosis or myocyte changes exist. In the left ventricle, subepicardial scars can be associated with ischemic heart disease, especially if there is embolization of thromboembolic material from epicardial coronary lesions. In cases of arrhythmogenic right ventricular cardiomyopathy (ARVC), the typical findings at autopsy include areas of thinning of the right ventricle, with fibrofatty change, in areas where fat is not normally found (outflow region, posterior wall) (see the image below). Pathologic findings at autopsy are wide ranging, depending on the stage and extent of the disease. 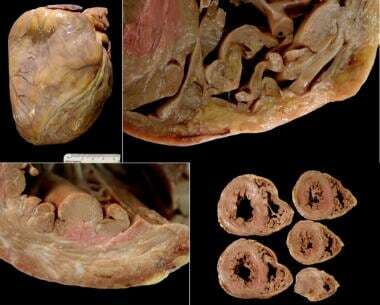 Gross findings at autopsy, arrhythmogenic right ventricular cardiomyopathy (ARVC). A suspicion of the diagnosis occurs if the right ventricle appears dilated, especially fatty, upon initial inspection of the heart (top left). Actually, aneurysms occur in approximately 35% of patients when evaluated by imaging. At autopsy, dilatation such as seen in this example occurs in 40-50% of cases, with true aneurysm being less common. The fibrofatty involvement of the right ventricle (upper right) is typically patchy; in this case, a segment of fatty replacement exists, without significant thinning or aneurysm, features that were once considered pathognomonic of the disease. Left ventricular scarring is generally subepicardial, but in this case (bottom left), the scarring is more random, reflecting the phenotypic heterogeneity of ARVC. On cross-section (short-axis cuts) seen at low magnification (bottom right), the changes are not particularly striking of a specific cardiomyopathy; it is almost the rule that careful examination for fibrofatty infiltrates is necessary for adequate sampling that will lead to the diagnosis. Autopsy studies from patients who die suddenly with the disease demonstrate biventricular involvement in most cases, with subepicardial left ventricular involvement and right ventricular fibrofatty infiltration. Histologically, the ventricle in arrhythmogenic right ventricular cardiomyopathy (ARVC) may show a range of changes, with the dominant feature being fatty or fibrofatty replacement of the myocardium (see the image below). It may appear randomly "moth-eaten," with destruction of the normal myocytes via inflammation, scarring, and fat replacement; show patchy areas of full-thickness loss of myocytes and replacement by fibrofatty tissues; or show inflammation composed of lymphocytes and macrophages, with only rare myocyte necrosis. Microscopic features of arrhythmogenic right ventricular cardiomyopathy (ARVC). The top left demonstrates an area of fat in the right ventricle, with fibrous tissue highlighted by the Masson trichrome stain. The areas of fat are irregular, in contrast to the normal "marbling" appearance seen in the anterior right ventricle, in which relatively even, linear fatty areas exist. The fat in ARVC is considered "metaplastic" or secondary to an area of previous myocyte destruction. In contrast to the right ventricle, the areas of involvement in the left ventricle (top right) often show fat and more fibrous tissue. A higher magnification demonstrates altered myocytes with vacuoles, which are seen in all areas of fibrofatty infiltration (bottom left). Depending on the degree of sampling and definition of myocarditis, inflammation with myocyte necrosis is seen in over 25% of cases (bottom right). The myocytes in the involved areas appear attenuated, with loss of cross-striations and areas of myofibrillar loss imparting a "bubbly" appearance. 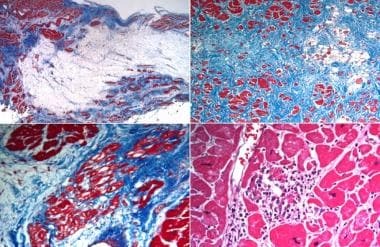 The changes are nonspecific, as fat may be a component of ischemic scarring and myocyte vacuolization may be seen in other forms of cardiomyopathy, as well as inflammatory infiltrates. Lobo FV, Silver MD, Butany J, Heggtveit HA. Left ventricular involvement in right ventricular dysplasia/cardiomyopathy. Can J Cardiol. 1999 Nov. 15(11):1239-47. [Medline]. Sen-Chowdhry S, Syrris P, Ward D, Asimaki A, Sevdalis E, McKenna WJ. Clinical and genetic characterization of families with arrhythmogenic right ventricular dysplasia/cardiomyopathy provides novel insights into patterns of disease expression. Circulation. 2007 Apr 3. 115(13):1710-20. [Medline]. Burke AP, Farb A, Tashko G, Virmani R. Arrhythmogenic right ventricular cardiomyopathy and fatty replacement of the right ventricular myocardium: are they different diseases?. Circulation. 1998 Apr 28. 97(16):1571-80. [Medline]. Basso C, Thiene G, Corrado D, Angelini A, Nava A, Valente M. Arrhythmogenic right ventricular cardiomyopathy. 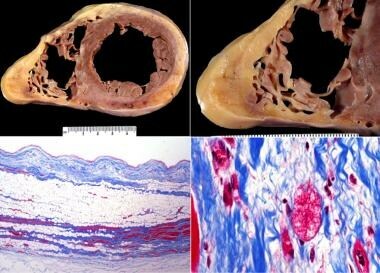 Dysplasia, dystrophy, or myocarditis?. Circulation. 1996 Sep 1. 94(5):983-91. [Medline]. Bauce B, Basso C, Rampazzo A, et al. Clinical profile of four families with arrhythmogenic right ventricular cardiomyopathy caused by dominant desmoplakin mutations. Eur Heart J. 2005 Aug. 26(16):1666-75. [Medline]. Dokuparti MV, Pamuru PR, Thakkar B, Tanjore RR, Nallari P. Etiopathogenesis of arrhythmogenic right ventricular cardiomyopathy. J Hum Genet. 2005. 50(8):375-81. [Medline]. Fidler LM, Wilson GJ, Liu F, Cui X, Scherer SW, Taylor GP, et al. Abnormal connexin43 in arrhythmogenic right ventricular cardiomyopathy caused by plakophilin-2 mutations. J Cell Mol Med. 2009 Oct. 13(10):4219-28. [Medline]. Rampazzo A, Nava A, Malacrida S, et al. Mutation in human desmoplakin domain binding to plakoglobin causes a dominant form of arrhythmogenic right ventricular cardiomyopathy. Am J Hum Genet. 2002 Nov. 71(5):1200-6. [Medline]. [Full Text]. Syrris P, Ward D, Evans A, et al. Arrhythmogenic right ventricular dysplasia/cardiomyopathy associated with mutations in the desmosomal gene desmocollin-2. Am J Hum Genet. 2006 Nov. 79(5):978-84. [Medline]. [Full Text]. Zhang M, Tavora F, Li L, Fowler D, Zhao Z, Burke A. Arrhythmogenic right ventricular cardiomyopathy: reassessing the link with the desmosome. Pathology. December 2012. 44:596-604. [Medline]. Francés RJ. Arrhythmogenic right ventricular dysplasia/cardiomyopathy. A review and update. Int J Cardiol. 2006 Jun 28. 110(3):279-87. [Medline]. Thiene G, Corrado D, Basso C. Arrhythmogenic right ventricular cardiomyopathy/dysplasia. Orphanet J Rare Dis. 2007 Nov 14. 2:45. [Medline]. [Full Text]. Ferreira AC, Garcia SA, Pasquale MA, Canoniero MJ, Peter A. Arrhythmogenic right ventricular dysplasia in the elderly. Heart Dis. 2003 Nov-Dec. 5(6):393-6. [Medline]. Groeneweg JA, Bhonsale A, James CA, et al. Clinical Presentation, Long-Term Follow-Up, and Outcomes of 1001 Arrhythmogenic Right Ventricular Dysplasia/Cardiomyopathy Patients and Family Members. Circ Cardiovasc Genet. 2015 Jun. 8 (3):437-46. [Medline]. Boggs W. Long-Term Outcomes Favorable for Arrhythmogenic Dysplasia/Cardiomyopathy. Reuters Health Information. Available at http://www.medscape.com/viewarticle/843616. April 24, 2015; Accessed: October 27, 2015. Corrado D, Fontaine G, Marcus FI, et al. Arrhythmogenic right ventricular dysplasia/cardiomyopathy: need for an international registry. Study Group on Arrhythmogenic Right Ventricular Dysplasia/Cardiomyopathy of the Working Groups on Myocardial and Pericardial Disease and Arrhythmias of the European Society of Cardiology and of the Scientific Council on Cardiomyopathies of the World Heart Federation. Circulation. 2000 Mar 21. 101(11):E101-6. [Medline]. Hamid MS, Norman M, Quraishi A, et al. Prospective evaluation of relatives for familial arrhythmogenic right ventricular cardiomyopathy/dysplasia reveals a need to broaden diagnostic criteria. J Am Coll Cardiol. 2002 Oct 16. 40(8):1445-50. [Medline]. Asimaki A, Tandri H, Huang H, et al. A new diagnostic test for arrhythmogenic right ventricular cardiomyopathy. N Engl J Med. 2009 Mar 12. 360(11):1075-84. [Medline]. Burke AP, Robinson S, Radentz S, Smialek J, Virmani R. Sudden death in right ventricular dysplasia with minimal gross abnormalities. J Forensic Sci. 1999 Mar. 44(2):438-43. [Medline].